This microscope with a digital camera is designed for students to learn science, offering five magnification settings, 40X, 100X, 250X, 400X and 1000X. It comes with a 5MP USB2.0 digital camera, full optical glass elements, all metal framework, 360 degree rotatable monocular head, coarse fine focus, and the LED illumination system that uses either wall-power (adapter included) or three AA batteries (or re-chargeable batteries). The digital camera captures still images and video, and allows you to view a live stream on your PC. The included software for Windows offers image-development and measurement tools, as well as advanced compositing features such as image-stitching and extended-depth-of-focus. Independent preview and capture resolutions allow you to view high-speed video while capturing high-definition images. On Mac computers, the camera can be used as a driverless imaging device, compatible with various applications, such as ProScope and Photo Booth.. 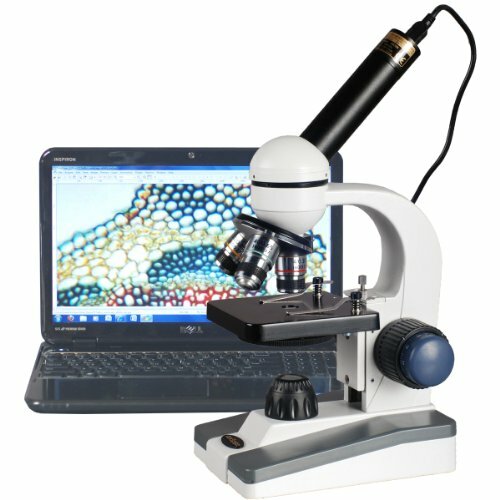 This microscope is ideal for home school uses or for students from elementary to high school. It is also an excellent instrument for hobbyists. It is brand new in original box. Its Retail Value is $500. If you have any questions about this product by AmScope, contact us by completing and submitting the form below. If you are looking for a specif part number, please include it with your message.